Description: Regal and romantic, this sleeved princess wedding dress features a sheer bodice of geometric beading and Swarovski crystals, accenting the illusion bateau neckline, illusion long-sleeves, and illusion V-back. 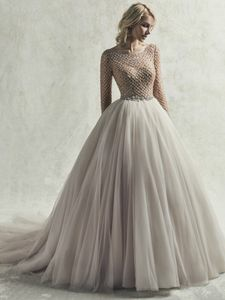 An attached beaded belt accented in Swarovski crystals completes the tulle ballgown skirt. Finished with crystal buttons and zipper closure.